We’d love your help. 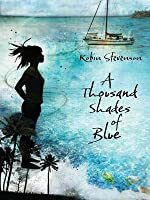 Let us know what’s wrong with this preview of A Thousand Shades of Blue by Robin Stevenson. To ask other readers questions about A Thousand Shades of Blue, please sign up. First off, I'm a sucker for books set on sailboats, as this one is. Secondly, I like protagonists who are a little awkward, unsure of themselves. Rachel is certainly not finished, but she's heading in the right direction. The broken sister and the troubled parents kind of pile it on, but somehow it manages to work without being too heavy-handed. I liked the story, I liked the characters, and the writing took me to the deck of the 'Shared Dreams' and left me looking into the water. Nicely done. A Thousand Shades of Blue is a portrait of a dysfunctional Canadian family as they sail from Ontario and learn a lot more about themselves and each other than they ever dreaded. It's a lot better than I expected it would be, and the author really has a talent for describing scenery and characters. I have serious feels about this book. First this book contains cheating and inappropriate age gaps. You have been warned. Also the way it is written has a strong suggestion of approval. Which frankly bugs me the most because this a middle grade book. This book made me want to abandon life as I know it and take off travelling. In a big way. Just not by boat #seasickness. This book also gave me major feelings of a lack of resolution. Which would be realistic and totally fine if it were targeted at I have serious feels about this book. First this book contains cheating and inappropriate age gaps. You have been warned. Also the way it is written has a strong suggestion of approval. Which frankly bugs me the most because this a middle grade book. This book made me want to abandon life as I know it and take off travelling. In a big way. Just not by boat #seasickness. This book also gave me major feelings of a lack of resolution. Which would be realistic and totally fine if it were targeted at adult like me. it isn't though it is being marketed to kids and teens who are going to read and possibly learn unhealthy relationship habits. A year long voyage to the Bahamas may sound like the dream vacation, but to Rachel it is a disaster waiting to happen. Ever since Rachel's sister moved out, her parents have been fading away. Rachel's distrait father is suddenly trying to "patch things up" by taking them on this sailboat adventure; and Rachel's mom is becoming more distant than ever. Fake even. When their boat's rudder is cracked, Rachel and her family is stuck in Georgetown where Rachel and her brother Tim are once again faced A year long voyage to the Bahamas may sound like the dream vacation, but to Rachel it is a disaster waiting to happen. Ever since Rachel's sister moved out, her parents have been fading away. Rachel's distrait father is suddenly trying to "patch things up" by taking them on this sailboat adventure; and Rachel's mom is becoming more distant than ever. Fake even. When their boat's rudder is cracked, Rachel and her family is stuck in Georgetown where Rachel and her brother Tim are once again faced with an ugly secret. Then there's Col, the cute twenty-something guy from The Flyer. Will the secrets and lies destroy Rachel's family, or will Rachel destroy herself? A Thousand Shades of Blue is a unhappy look into the life of one imperfect family....with some major issues. And what family truly doesn't? Rachel's voice is the voice of hundreds of girl who suffer from a distressed family. Her father is a workaholic who never pays any attention to her; and her mother is a complete emotional wreck, so naturally the glue that holds the family together, is coming unstuck. Rachel reacts, of course, makes some wrong choices and discovers that lies are the true enemy of families. With that said, I can honestly say this is an edgy book and if I had known what it what exactly about, I would spare myself reenactments of true events. In the end, A Thousand Shades of Blue brought a positive message about families and looking for the "cure" in the wrong place. Though I would never react the same way Rachel did, I feel many girls could relate to Rachel's feelings of pain and the hurt of just being ignored. This book may very well be somewhat of an answer to those who are going through tuff family times. I neither encourage nor discourage reading this book-it is entirely up to you since it is a mutual subject. Robin Stevenson has written six books for young adults including Out of Order, Impossible Things, Big Guy, Dead on the Water, and her latest book, Inferno which recently came out in April. She lives in B.C, Canada. This review has been hidden because it contains spoilers. To view it, click here. Rachel is living out millions of high school students dream- sailing to the Bahamas (with her family), going to the beach everyday, and doing her schoolwork via correspondence. However, her life is not what it seams. First- Rachel's family is leaving behind her older sister Emma (who was left brain damage after a car hit her when she was six). Second- her mom starts having an affair with another "cruiser" named Will. Rachel's distant father- Mitch- continues with the facade that they are the per Rachel is living out millions of high school students dream- sailing to the Bahamas (with her family), going to the beach everyday, and doing her schoolwork via correspondence. However, her life is not what it seams. First- Rachel's family is leaving behind her older sister Emma (who was left brain damage after a car hit her when she was six). Second- her mom starts having an affair with another "cruiser" named Will. Rachel's distant father- Mitch- continues with the facade that they are the perfect family, her younger brother, Tim- prefer books more than anything and Rachel finds herself smother by her family's dishonesty. Her only solace is her friendship with Becca- a nineteen year old on her on sailing trip and her crush on twenty-five year old Col- a well know player. When everything comes to a head when Tim runs off one night- Rachel let's everything all out- her resentful towards her parents, her guilt towards Emma, and her feelings for Col. Her parents take a short break from each other and her mom takes the kids to Nassau to figure things out. On their mini 'vacation" Rachel confronts her mother about her affair. While her mother is uncertain about the future- she is clear that she does not want Tim and Rachel to slip away from her like she thinks Emma did all those years ago. Rachel is a sixteen-year-old daughter trapped on a year-round sailing trip aboard a small boat with her dysfunctional family. Her dad, a child psychologist more in tune to the problems of his patients than his own children, suggested the trip to repair the rift between the family. However, Rachel feels guilty leaving her mentally-impaired older sister behind, along with missing her friends. Rachel's parents continue to fight on the trip, her brother, Tim, seems to be bitter and the fringe hoping to hold their parents together, and Rachel never has anyone her age to be with. Ultimately, Rachel and Tim discover a grave secret that they are afraid to confront, threatening the continuity of their family that they wish to hold onto. I enjoyed this story, as it had a page-turning plot as Stevenson effectively sets up the suspense so that the reader feels the need to continue reading the story to its ultimate conclusion. Along with some coming-of-age storyline, A THOUSAND SHADES OF BLUE provides for some interesting characters and a creative setting. I only wish that the author chose to develop her characters a bit more, and elaborate on the beauty of the Caribbean and the surroundings, adding further depth to the story. r the rudder is damaged on some rocks and they have to return to the Bahamas until it can be repaired. Will the family be able to survive the trip in one piece? Or is the damage to the boat just a symbol of a broken family that cannot be fixed? Stop by the library today to pick out a really good book and have a good weekend, Arrows. The cover is pretty (though the floating-girl silhouette is odd). But the story was your typical "Oh no, my family has PROBLEMS. I'm going to act out because I have to feel in control of something. Oh look, my sibling isn't as much of a looser/nerd/weirdo as I thought. Maybe my parents aren't, either. Hope lives on!" but set on a boat. And for taking a family sailing trip, they didn't even sail very much. It wasn't bad, but it wasn't anything special, either. If you want to read a book that also i The cover is pretty (though the floating-girl silhouette is odd). A Thousand Shades of Blue is a gripping book of family ties. Rachel is incredibly unhappy and lost in her messed up family and just wants it to be better again, which is hard when her sister, Emma, who kept them glued together, has moved into a group home. Rachel’s sadness turns to dread when, of all things to do, her father and mother decide to pull Rachel and her brother; Tim, out of school a year to “fix the family” however, it makes the family worse, or does it? Rachel starts to feel closer A Thousand Shades of Blue is a gripping book of family ties. Rachel is incredibly unhappy and lost in her messed up family and just wants it to be better again, which is hard when her sister, Emma, who kept them glued together, has moved into a group home. Rachel’s sadness turns to dread when, of all things to do, her father and mother decide to pull Rachel and her brother; Tim, out of school a year to “fix the family” however, it makes the family worse, or does it? Rachel starts to feel closer to her brother than ever when they uncover a shattering secret. I am guilty of choosing a book based on their cover. This edition had a lovely cover. I did read the blurb before checking this book from the library and found it interesting enough to pick up. This is a coming of age story about a teenage girl out on a year long family sailing trip. The family relationships are strained and uncomfortable, will this trip bring them closer or rip them apart. The story gets to a slow start but it is truly a good story. There is even a hint of mystery and romance m I am guilty of choosing a book based on their cover. This edition had a lovely cover. I did read the blurb before checking this book from the library and found it interesting enough to pick up. Rachel's parents decide the famliy needs a year-long sailing trip to the Bahamas to give them quality time together. The reality is that life for Rachel and her younger brother Tim include a lack of privacy, closer contact with their parents' tensions and precious little of the expected beach life the trip would seem to promise. And worst of all, Tim and Rachel discover something that threatens to do more than rock the boat they are living on. I really enjoyed this book. There was this pull to it that got me hooked immediately... But I didn't quite understand the plot of this story. Was it Rachel trying to survive her own life, her family problems or what? In my opinion, the plot wasn't explained very well, but overall, it was a great read. I quite enjoyed the writing in this story of a 16 year old girl stuck for a year on a sailing boat with her parents and 12 year old brother. It's one of those 'bring the family together' trips that tend to be traumatic for all concerned. The events and emotions are believable. I am thinking a trip to the Bahamas would be nice. But I think I'll fly. This book was average, broken family, troubled teenage girl...But I liked how Robin Stevenson used the shades of water as a metaphor for the way Rachel's family interacts. Other than that...it was pretty average. Sorry about my horrible reviews. I actually quite enjoyed this book. I picked it up without having any idea what it was about except for the sailing theme and I read it while on a sailing trip. I found myself really liking this book and relating all the sailing activities back to what I was doing on the sailboat. Was very good. But didn't have that extra something to bring it up to a 4. Zzzzzzz. So boring. The writing skipped over so many details and became confusing. This was okay, it was the story of a girl and her family who spend a year sailing a ship from Canada to the Bahamas and back. I wasn't absorbed by it or sucked into the story, but it was okay. It was a good book and i love the ocean and bahamas so thats why i read it and its more of a loving story than an ocean book!Its a good book though! I liked it although it could have maybe been more involved. It was a little bit predictable although probably pretty true to life. A very good book. It kept me reading the whole way through.